Pattern Recognition – documenting two or more references in a short period of time to a common term or object which I had never before consciously observed. Milkybar is a white chocolate confection that is produced by Nestlé and sold in Australia, New Zealand, India, Ireland, Kuwait, South Africa, Spain, and the United Kingdom. It sold under the name Galak in Ecuador, Brazil, and the rest of Continental Europe. Nestlé have produced white chocolate since the 1930s, and started using the brand Galak in 1967. In many European countries a version with puffed rice is also available. 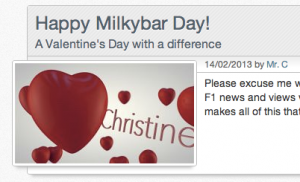 The Formula 1-centric site Sidepodcast mentioned Milkybars in the not-Formula-1-related post Happy Milkybar Day. I assumed at the time that this was some form of candy bar that was available in the US but under a different name. Mr Clegg on the phone. Bit upset that the horse meat scandal has reached Nestlé. Says he can’t believe there’s horse meat in Milkybars. This entry was posted in Pattern Recognition by jetmore. Bookmark the permalink.